This necklace was formed as it fit my state of mind at the time. This jumbly jamb of beads and chain was my thoughts as they bounced from thought to thought, chore to chore, task to task. The first row of the necklace is a repeating pattern of white jade and silver plated spacers. From there each chain is longer and a mix of light chain and gemstones. Featured within are Amethyst, Bowenite, Jades and Jaspers, Agates, Quartz, Unakite, and Rhodonite to name but a few. All beads sit on wire wrapped loops attaching them to the chain for extra security. This necklace definitely makes a statement. The shortest chain measures 16 inches and the longest 22 inches. 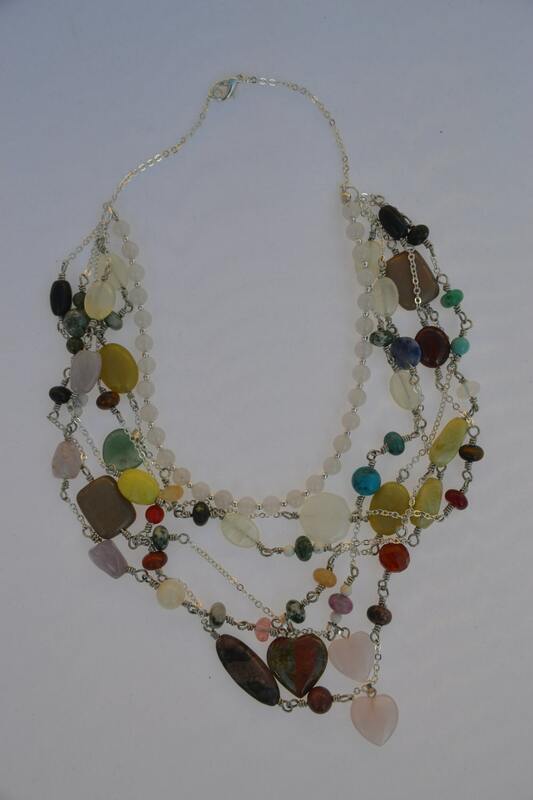 Folksy :: Buy "Rainbow Glass Bead and Chain Necklace"